Czech cosmetic firm Ryor is known throughout the entire country, and its products can be found on shelves worldwide. How did owner Eva Štěpánková lead her firm to such a significant market position? “RYOR, CZECH DIOR”, people sometimes say. Perhaps this is one way for Czechs to appreciate the fact that the local cosmetics producer is capable of asserting itself in competitive foreign markets. Or maybe it is an omen as to how far the firm may eventually go. Time will tell, but the fact is that during its eleven years of existence, Ryor has been able to capture a 10% share of the overall Czech cosmetic market and now finds itself included among such names as Avon, Oriflame, Palmolive, and Ponds. It is not hard to understand where the success of Eva Štěpánková, and Ryor, lies. It is based on three simple factors: timing, constant monitoring of recent trends, and products of a quality comparable to western goods but at significantly lower prices. 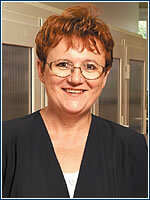 A chemical technology graduate, Štěpánková worked for almost 20 years as manager of cosmetic production at the Institute of Medical Cosmetics in Prague. Like similar institutions, it started to slowly collapse after the revolution, yet the number of private cosmetic salons increased throughout the entire country. “The profession of cosmetician had only just begun at the time, so professionals didn’t have many products to work with,” Štěpánková recalls. “So my colleagues and I started to prepare products for them at home.” Revenues for its first year of business – CZK 700,000 – proved that the products sold well. In the next year, 1992, production of retail goods began. “Cosmeticians wanted products for their customers. After treatment, customers were so satisfied that they wanted to use the product at home, so cosmeticians tried to accomodate them.” The first four products were born. Since that time, the firm has recorded continuous development: not only has the range of products grown each year, but production volume, revenue and the number of employees have increased as well. Today the Ryor line includes over hundred products – 40 for cosmetic salons and 87 sold in retail stores. As time went by, the basic line of creams for all skin types was expanded with hair care and body care items. Quality is he best advertisingIn the beginning, Ryor had no assets for advertising. “Promotion was unthinkable. We were just glad to have money for materials,” recalls Eva Štěpánková, owner of the firm. “Quality was our best advertisement. Thanks to this, we created customer awareness.” In 1994-95, the firm began purchasing TV spots and printed ads in magazines. Štěpánková considers consumer education very important. “Many people believe in advertisements, I understand this. With such an excess of products on the market, it’s hard to figure out which one’s best for you,” she says. Therefore, Ryor has put a strong emphasis on educational activities – not only by participating in various media debates concerning healthy lifestyles, but also in the form of cooperation with numerous health care organizations. Today, Ryor’s development laboratories work on two projects. The first one is the development of products for molding the body, done in cooperation with the STOB (Stop Obesity) organization. This line of products is already available, and a marketing campaign is currently being prepared to be launched in the fall. The second significant project, supported by the World Health Organization, concerns the use of amaranth oils. The ancient Mayans knew about the amaranth plant, and now scientists are trying to find the best possible use for it, as it has many beneficial effects on the human body. Ryor currently makes two products containing amaranth oil for the highly sensitive skin of people suffering from cancer. In 2001, a network of specialist shops covering the entire Czech Republic was established offering the full Ryor product line, as well as additional services such as cosmetic consulting. The firm also engages in sponsoring events for handicapped adults and children. According to Štěpánková, Ryor’s typical customers are women between the age of 40 and 50, who have more time to take care of themselves but are unwilling to pay thousands of crowns on cosmetics. If these customers are able to choose between a cream from L’Oréal for more than CZK 300 and one from Ryor for CZK 80, most of them will pick the Czech product.